Brasserie Prince opened to much fanfare recently. Situated in the Balmoral Hotel, the Roux family have opened a relaxed style restaurant. It was a little chaotic for us on arrival, which was odd considering that the restaurant was not very busy. There were two men in front of us who were speaking to one of the front of house staff. Another three or four staff were hovering. The men were taken to their table and then we were left there for a fair few minutes before finally being acknowledged and taken to our table, even though staff were shooting past us back and forth at quite a rate. The menu is French on one side and English on the other. I’m not really sure what the point of that is other than coming across as a bit pretentious – or perhaps I’m getting grumpy as I get older. Anyway, if steak tartare is on the menu, I like to try it. This was at an eye watering £27 but as it was just after pay day I thought I’d see what exacl;y was so special about it to justify the price tag, which was quite a bit more than many other items on the menu. My friend opted for the rump steak. My steak tartare came with fries. This was the only thing that was different – well apart from being hidden under a mound of greenery and parmesan. The flavour was good and the quality of the meat was clear. The fries were decent enough. However, whilst nice, it was no better than what I can get elsewhere in the city for half the price. Across the table from me, the steak was being appreciated. This came with onion rings and French fries. It looked quite uninspiring in the plate though. That said, the steak was cooked well and was gobbled up by my friend. We clearly had room for dessert, so I chose the dark chocolate mousse and my dining companion opted for the seasonal fresh fruit tart. My mousse was simple but beautiful. It was accompanied by some Gavottes biscuits which were incredibly light. My friend was a little disappointed with her fruit tart. She had been hoping for some kind of crème patisserie in it with a selection of fruit on top but what transpired was a fruit purée with two fruits on top, albeit plentiful. This was still a nice dessert but perhaps needs a little more explanation on the menu. Overall we felt underwhelmed by Brasserie Prince. It was expensive for what it was. No doubt it will do well on the name and location but I’d pick many other places to eat before this one. Would I eat here again? Maybe but unlikely. £77 for two mains and two desserts plus a glass of wine. Café Tartine is a family run French bistro found on the Shore. As the nights are drawing in, Café Tartine offers a cosy experience with candles in wine bottles scattered about the room. The menu covers the A-Z of rustic French food. I chose the chicken liver parfait, followed by pan-seared fillet of salmon. My dining companion opted for the French onion soup to start followed by mussels with fries. As the starters were delivered to our table, we could see we were in for a lot of food. My parfait was delivered on a wooden board, with two large slices of toast, salad and a small pot of cranberry and orange jam. The parfait was wrapped in a slice of prosciutto which I am not sure added much. However, the whole dish was lovely. Even the salad was dressed well. I would have liked a little more of the cranberry jam but that’s more of a personal preference. Across from me, my friend had been given a ginormous bowl of French onion soup. She lapped up most of it though as it was so delicious. I also had a try of it and think this would be a great choice for lunch on a cold winter’s day. This soup also came with some large chunks of bread. The mains were just as generous as the starters. My salmon was an incredible size. I had never had salmon skin so crispy either. The fillet sat in a pool of mussel veloute, which was truly beautiful. A handful of mussels, still in shells, were placed around the dish. To finish it off, there was samphire, green beans and a luscious pomme puree. It was so good that I ate way past the point of fullness! My friend was tucking into her large pot of mussels and accompanying fries. They were of good quality and the sauce was good. For those who can’t face a kilo pot of mussels, there is also a half kilo pot available on the list of starters. We were way too stuffed for dessert, which was a shame as they looked really good. I would happily have the dishes a little smaller for a pound or two cheaper so I could fit in something sweet at the end. That being said, we left very content with what we’d eaten. Cost £55 for two starters, mains and one large glass of wine. Le Roi Fou can be found just off Broughton Street. Unassuming from the front, this French restaurant is understatedly elegant on the inside. We were seated at the back of the restaurant, which gave it a cosy feel. We were given a lovely little amuse bouche, whilst looking at the menus, which was essentially made from chickpea flour and tasted amazing. This was served with a dip which was delicious. We also got some very warm bread to dip in oil too. We were faced with three different menus; a pre-theatre, an a la carte and a tasting menu. We changed our mind several times but in the end chose the a la carte menu to order from. I went for the steak tartare as a starter (also available as a main) and then liver with bacon for my main. My dining companion chose the spicy Caribbean fish soup to start followed by the braised globe artichoke for her main. The starters were a healthy size, which I was a little surprised at (in a good way) as I was expecting a small portion considering the style of the restaurant. I do like having my tartare with the egg yolk presented on top, which wasn’t the case here, but it really made no difference as the dish was fully of zing and bite. I loved every mouthful of it. It was served with salad leaves and crispbreads and I’m pleased to report that the crispbreads were just thick enough to take the weight of the tartare. Thumbs up! On the other side of the table, the spicy soup was not very spicy, which led to a small level of disappointment. However, it was still considered a lovely soup. This also came with crispbreads to dunk in, should you so wish. The mains were also a great size. My liver was plentiful and very soft. However, there was a piece that was thicker at one end and that bit tasted a little underdone (but not enough to put me off eating that too!). The bacon was incredibly crispy but not burnt. The chimichurri was subtle and worked with the dish and the red wine sauce pulled it all together. I had ordered a side of girolles with sugar snap peas as I felt I was overdoing it on the meat with my dish choices. These went really well with the liver and the other small amount of greens on the dish. I polished off the lot. Across from me, my friend was delighting in the artichoke. This came with a poached duck egg, greens and girolle mushrooms. She had ordered a side of fries but found that they weren’t really needed, so ate as many as she could fit in but found she didn’t make much of a dint in the bowl. We decided to give dessert a go. My stuffed friend chose the light option of a lemon sorbet with came with a shot of gin. I would have gone for that but decided to try the honey poached peach and apricot. My dessert ended up also being quite large so I struggled to finish it. However, the fruit was lovely. It was supplemented with gooseberries as some other red berry I couldn’t identify. On top was a pistachio crumble and then a scoop of crème fraiche ice cream. I was mildly surprised that the fruit was warm as the ice cream scoop was not melting. What magic was this? It was simply sitting in the crumble rather than the warm fruit. My friend found the sorbet tart but refreshing. The shot of gin was generous and seemed larger than a standard shot but could be the optical illusion of the chosen glass. 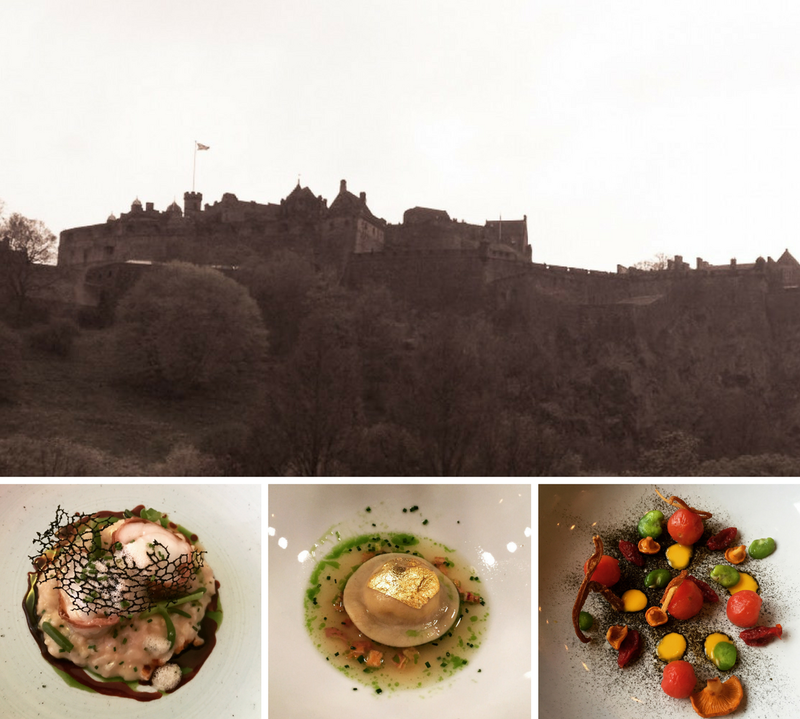 Overall we thought Le Roi Fou was a nice addition to the Edinburgh restaurant scene. The staff were incredibly helpful and friendly without being intrusive. I think we’ll be back to try the tasting menu. A joint venture from Maison Bleue and Social Bite and known through the highly publicised visit by Leonardo Di Caprio at the end of last year, we popped in to Home to see what they had to offer. We’d previously visited Maison Bleue so knew we shouldn’t be disappointed. Home offers great value lunch and early evening menus as well as a reasonably priced banquet (3 course) menu and the standard a la carte option. We decided to go with the early evening menu, offering two courses for £14.95. I went for the surprise calamari followed by the chicken kemia with merguez sausage. My friend chose haggis balls followed by chicken tagine. We were given bread and dipping oils whilst we waited for our starters. Our side plates were beautiful mis-matched china. Our table also had a pen and a little ‘pay it forward’ card, explaining the idea and suggesting prices for paying forward from a coffee (£2) up to dinner for two (£20). You can also donate more should you wish and you can also use gift aid too. Just complete this in time for when you ask for the bill and it’ll get added on. The starters came quite quickly. My calamari surprise looked great and was served in a small skillet. I guess the surprise was that it was served on a bed of peppers and onions. The calamari was cooked perfectly and the batter was seasoned beautifully. The peppers and onions were delicious and the whole lot came together wonderfully. On the other side of the table, ooohs and aaaahs were being directed at the haggis balls They were coated in a beer batter and were served with clapshot tatties and a whisky sauce. They were gone within an instant (well that’s how it seemed) which was a testament to how good they were. The mains were also speedily presented. My chicken was delivered on skewers, with the sausages, couscous, checkchouka ratatouille and salad on the side. Sadly, my chicken was over cooked and dry. If there had been a sauce it may have been less noticeable but as it was, it made it a little hard going. The sausages were gorgeous and the rest of the dish was great, so the chicken was a bit of a shame. On the other side of the table the tagine was brought in the traditional dish. Inside, the meal wasn’t attractive looking but was beautiful. My friend seriously could not fault it. The tagine came with peas, artichokes and preserved lemons with a side of couscous. For those who don’t like meat on the bone, this won’t be for you. We enjoyed our time at Home (ignoring the dry chicken). The staff were friendly and the service was quick. We paid forward a dinner for two. We recommend the tagine! Cost £53 for two early evening 2 course deals, one glass of wine plus a donation of £20. We went to try some French cuisine down by the Shore. Bistro Provence sits happily alongside restaurants such as Kitchin on this strip. Apparently the venue has been a French restaurant in some form for many years. We were warmly welcomed to this restaurant. The staff kindly placed us near a heater as it was freezing outside. The restaurant itself is full of understated hues, with creams and classic French colourings throughout the restaurant and paintings on the walls. Classics were also on the menu, where there seems to be something for everyone. Set prices for two and three courses, with the three course one coming in comfortably under £30 but Bistro Provence also offers a tasting menu if you fancy letting the chef make the choices for you. The menu had a good selection and I had a few choices I was toying with but went for roast pigeon breast followed by seabass. My friend, by coincidence, went for my second choices, roast pepper and chilli panna cotta followed by tagliatelle. Whilst the food was being prepared, we were given a couple of canapés; salmon and cream cheese blinis and a tomato and Comte cheese whirl. As my dining partner is a veggie (and becoming vegan) I had both the salmon ones which were delicious. My dining companion confirmed the pastries were also great and tasted almost like a pizza. We also were given some bread which was lovely. The starters arrived on slates, which I’m not overly keen on eating from, no matter how nice they look. However, I soon forgot about the plates as I began to eat. My pigeon breast came with a shallot puree and walnuts. The pigeon was perfectly cooked, so it was delicate and soft. The red wine sauce and shallot puree worked very well with it, seemingly bringing out the flavour of the bird. I could have eaten tons of this dish. On the other side of the table, I was keen to hear how the panna cotta was. She said it was less chilli infused which allowed the flavour of the roasted peppers to shine through but maybe a bit more heat wouldn’t have been bad. She did encounter a similar problem to what I often find when I order pate, there is not enough accompanying bread/salad to panna cotta ratio, so a bit of the panna cotta was left. This is difficult to get right though and was really only a very minor niggle. The mains followed. My fish looked lovely and I couldn’t wait to tuck in. The seabass itself was cooked perfectly. The accompanying mussel and aioli sauce was a real treat. The sweet notes in it made the fish dance on the tongue (not literally of course – that would be weird). The mash was smooth and the chives gave it a lift. The spinach pulled it all together. I’d eat that all again in a heartbeat. The tagliatelle also looked beautiful and almost Spring like. Whilst initially confused where the tomato sauce was, it was placed under the pasta ready to mix through. The pasta itself was delicate and well made. An enjoyable dish according to my friend. So, dessert was definitely a go-er. My dining partner had been before, loved the crème brûlée so decided to have that again. I went for the bitter chocolate tart with salted caramel ice cream. Neither of us were disappointed. The tart was luxurious and rich but the accompanying fruit sauce drizzled on the slate cut through it to avoid any cloying sensation. The ice cream was light but creamy in equal measure. The crème brûlée was adored just as much the second time. The accompanying honey and almond madeleine was good too. Whilst the dessert was on the larger side, she soldiered on courageously and scoffed the lot! Bistro Provence was a delightful surprise. I don’t really know what I was expecting but this really made me happy. The food didn’t try to show off but was really good, with no gimmicks. Bear in mind if you like your big portions this might not hit the mark for you but if you like eating all three courses and feel pleasantly full afterwards, this is definitely worth a visit. Cost complimentary but likely to be around £55 for two three course meals. Please note that whilst this meal was complimentary, views expressed are my own. Thanks to Lisa from Crimson Edge PR for inviting me.